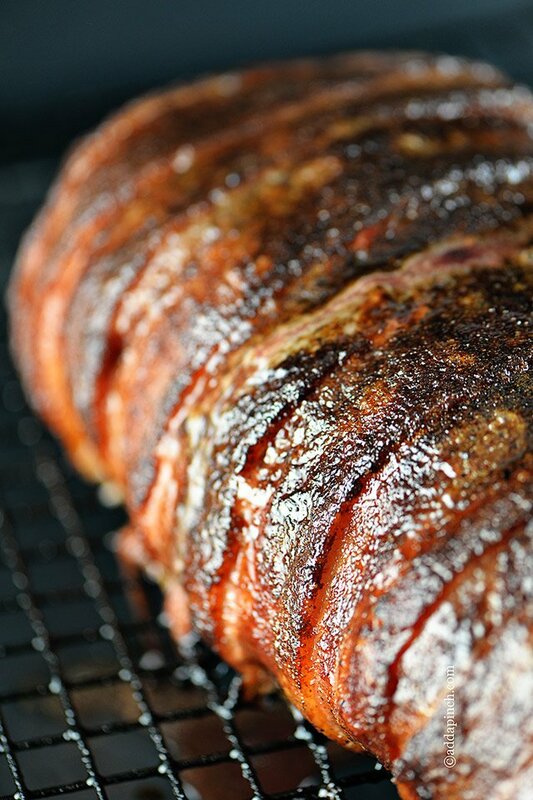 This simple bacon wrapped meatloaf recipe makes a moist, tender meatloaf that everyone loves! 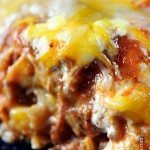 A favorite, updated classic recipe in my house! My family has always loved meatloaf. Always. It is one of the meals that I know I can prepare and everyone will love. But, then a while back I started making this meatloaf recipe that I wrapped in bacon and oh my goodness gracious, it was like we’d never had meatloaf before in our lives. Everyone went back for seconds and then asked for leftovers the next day for lunch. While the bacon definitely gives this meatloaf recipe an extra bit of smokey flavor, it also adds to the tenderness of this meatloaf. As the bacon renders in the oven, all of that seeps into the meatloaf as it bakes to give you one of the juiciest meatloaf recipes you’ve ever made. It’s amazing! And let’s not even get me started on that dry rub! Gosh, pure perfection on this! Here’s my bacon wrapped meatloaf recipe. Give it a try sometime soon. I really think you’ll love it, too! Add ground beef, green pepper, onion, garlic, worcestershire sauce, salt, black pepper, egg, and oats to a large bowl. Mix together until well combined. Shape meat into a rectangular shaped loaf and place on a broil pan that has been sprayed with nonstick cooking spray or lightly greased with olive oil for easy cleanup. Spread ketchup on top of loaf and place bacon slices on top, tucking edges underneath. Sprinkle liberally with spicy brown sugar dry rub. Bake for 1 hour, until internal temperature registers 155º F - 165º F, based on your preference. Remove from oven and allow to rest about 10 minutes before slicing and serving. Well Robyn, this sounds awesome! I love meatloaf and loved my Mother’s the best (of course) so I’m trying to find a new comfort meatloaf. I like the ingredients in this. The bacon…..OMG…..!!! I know I would love that!! Thanks for all the wonderful recipes you share!! You know I’m pinning it!! Delicious comfort food and bacon just makes it even better! Oh my! Need to make this asap!! I don’t care how old fashioned it is, I love meatloaf. And wrapped in bacon, how could it be anything but amazing? I’m a long way away, in New Zealand. I made this meatloaf today and wow – it’s really, really, really good. We had guests over for dinner and they all enjoyed the meatloaf and your chocolate cupcakes for dessert. Thank you so much for sharing. Gotta love the Internet! And gotta love people who are as generous as you are. I’m always looking for new recipes to try and this meatloaf is the best meatloaf I have ever tasted. OMG! Sounds really good even though I don’t eat meatloaf I will definitely be trying this. Anything with bacon has my taste buds watering. Hey, please help. I’m not familiar with the broiler pan, the one I have has two rows of slots, is that correct, or do I use a cookie rack on a cookie sheet? Looks awesome, so excited to make it. Yes, that is correct! You could also do as you said and use a rimmed baking pan with a cooling rack as well. Oats are an interesting ingredient! Do they sub for breadcrumbs which are typically used in meatloaf? If so, what measurement to sub crumbs for oats? This meatloaf was amazing! My husband is a sous chef and I usually don’t get a lot of compliments on my cooking when I make him dinner but he loved this so much! He was licking his plate clean. I will definitely be saving this recipe. The brown sugar spice rub was the best part! Spicy and delicious! Thanks for sharing! I’m so glad you both loved it, Lindsey!!! I made this last night and would give it 6 stars if I could! 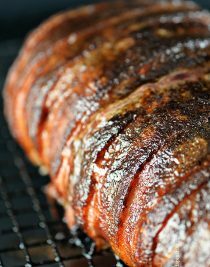 I made your spicy rub Robyn and between the rub and the bacon, the meatloaf was just stupendous- so moist and tasty! I used red peppers because I like them better than green but other than that I followed the recipe exactly. As I always say, you can’t go wrong with bacon – wonderful! Trying this today in my crock pot. Any suggestions for me? HI!!! i just made this last night and everyone loved it!!! I added cheese and mixed in the ketchup oops, but turned out to be a good oops! lol. thanks for the recipe! My husband and I made this last night and it was AMAZING!! The combo of that gorgeous spicy rub, and the bacon, turned what could be a mundane meatloaf into a work of art that was almost too nice to eat..
We will be trying more recipes from your site..thank you for being so generous with them! Last night I made this for the 2nd time. 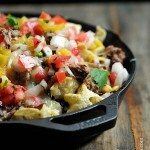 I absolutely love this recipe and so does my husband and my 2 yr old. 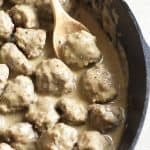 The first time I made this my husband said it made his top 5 favorite meals (and growing up, he dreaded meatloaf nights). Then last night I got a hug right after dinner just for making it again. I do a 50/50 ground beef & ground pork mix, yellow, orange or red pepper (cause I like them better than green) and 2 eggs instead of 1. Wow! Thank you so much for sharing that! I really appreciate it. I love it when my family loves, loves, loves a meal like that. It just does my heart good. The meatloaf turned out decent. My husband loved it, but I only thought it was just okay. It didn’t have a lot of flavor aside from the rub, which was only on top. I think if I made it again, I would only make it again if I put the rub all over the actual meatloaf. Also, I would have to cook it a lot longer, because there was a decent amount of pink inside. Even though my husband said he loved it, he didn’t want the left-overs. Overall, okay recipe though. 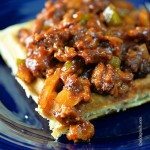 This is a great recipe if you tweek it a bit! I’ll be honest, the firt time I made it, I didn’t like it very much. The meat was not cooked in a lot of places and it was pretty dry. But it’s easily fixed!!! My husband absolutely loved the dry rub. He asked for this for his birthday dinner, so what I did was put some of the rub IN the meatloaf, put a TON on the ketchup that I spread over the whole meatloaf, and then put it on top as directed. It was AMAZING!!! Thank you for giving me a great go-to recipe! Want to make but I don’t know what the spicy rub is. Do you make it or buy it? 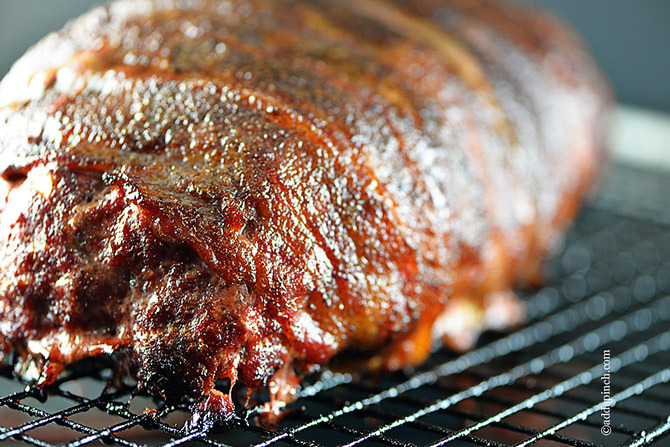 I found Spicy Brown Sugar Dry Rub located within the Add a Pinch list of recipes. (opps…hit the wrong key…continued). Wrapped Meatloaf earned 8 thumbs up. Not too spicy for the 9-yr old picky eater, not too sweet for the oldster & I left out the salt mixed into the meat for the Low Sodium Dieter. We used 15% fat ground beef, so it stayed moist. Next time, I would like to add some of the dry rub in the meat itself…hummmmm. A recipe we will be adding to the family cook book! Thank you! I made this meatloaf tonight, mostly because I wanted to change things up in regards to “meatloaf recipes”. Overall, it was alright. I believe it definitely needed longer than an hour as it was not cooked completely through and the bacon was still quite undercooked, and it also turned out a bit dry. Unfortunately I wasn’t particularly a fan of the recipe, but I’m sure with a bit of tweaking and straying from the original path, it could be a lot better. My boyfriend made this for me last night. I really appreciate him taking the time and making me something I’ve been asking for for the last 3 weeks but I had some issues with this recipe. The meatloaf turned out dry, really dry, but what surprised me the most was that the loaf was still very pink in the middle and the bacon a lot undercooked. The entire thing was also very lacking in flavor. Mind you, he followed the recipe to the tee. While I can deal with dry meatloaf, what I can’t deal with the fact that I have had the runs all day. I tend to have a stomach of steel and would have questioned if the ingredients had been sitting in the fridge for a few days but everything was bought fresh and immediately prepared. To conclude, this wasn’t my favorite meatloaf recipe, not the worst but next time we’ll stick with the Heinz recipe. Also, my boyfriend was nice in his review. I didn’t appreciate it so much that you deleted it. Tried this and it turned out GREAT!!! Love meatloaf and with it being wrapped in bacon it makes it even better. Thanks for sharing. I made this a while back. Want to make it again and can’t find dry rub recipe anywhere! Can u help?? I loved it and want to make it for my sons birthday. Made this but put bacon on bottom, Lined meatloaf pan with strips of bacon up the sides. brushed bacon with ketchup and sprinkled with dry rob. Then put meat mixture in and folded bacon over top of meat. When done flipped it over onto pan with foil and made bacon crisp under broiler. Grammy great! !